If you look at the musicians involved it really doesn't come as a big surprise; Mike Portnoy (Drums, ex-Dream Theater, Transatlantic), Steve Morse (Guitars, Deep Purple, Dixie Dregs), Dave LaRue (Bass, Dixie Dregs), Neal Morse (Keyboards, ex-Spock's Beard, Transatlantic, solo) and Casey McPherson (Vocals, Alpha Rev). These titans have been brought together by Bill Evans, who had an idea to bring world renowned musicians and producer Peter Collins together. A shortlist was made and all four musicians bought into the idea, all they needed was a vocalist. The idea was to bring in a pop singer and the choice fell on Casey. I loved the album straight out of the box, and now more than 25 spins later I love it even more, this is without a doubt one of the best albums I've listened to the past five years! An almost perfect mixture of elements I find important in an album; diversity, musicianship, outstanding vocals, crystal clear production and challenging music. 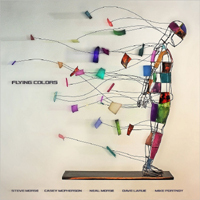 "Flying Colors" sounds fresh and unspoiled; it took them nine days to compose and record, so the jam-session factor is also a big factor to the equation. But don't worry - this album never takes off and turns into a meaningless jam without purpose... no everything has been done in the interest of the song! A timeless piece of music and already a very strong contender for Album of the Year, at least in my world!